Psychology at the Master’s level was introduced in Delhi University in 1957 under the Department of Philosophy and Psychology. 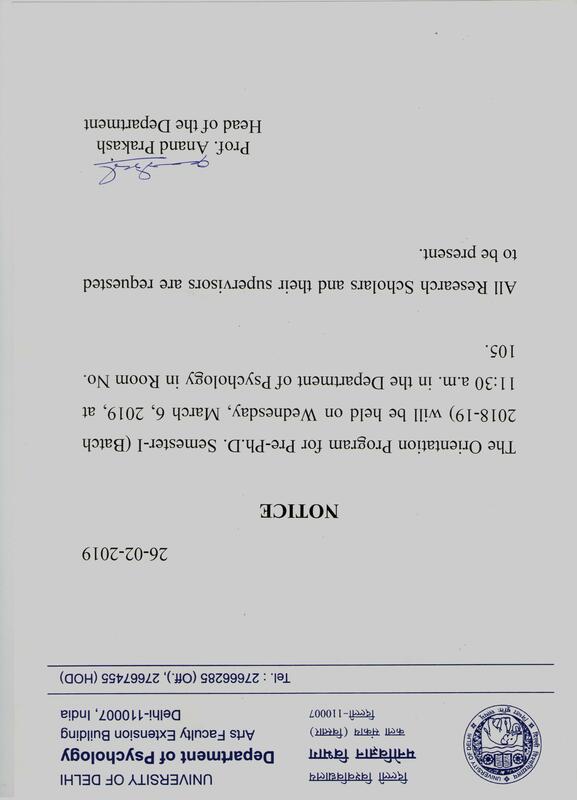 The Department of Psychology as an independent department was established in 1964 under the headship of Late Prof. H.C. Ganguli. The Department has two units, one at the North Campus and the other at the South Campus established in 1981. At the North Campus the courses offered are M.A. Psychology and Ph.D while at South Campus the course offered is M.A. in Applied Psychology. The University of Delhi, in order to cope with the ever-expanding student population, evolved a concept of multi-campus system during the early seventies, resulting in the establishment of South Campus in 1973. One of the objectives for its establishment has been to avoid replication of the existing course and provide necessary diversity in the programmes offered by the University at both the campuses. Keeping this in view, a number of new inter-disciplinary and applied science courses were started at the South Campus and the Psychology Department started the M.A. Applied Psychology Course at the South Campus. In its endeavour to widen the horizons of the Social Sciences, Applied Psychology Course was designed to train the professional psychologists to serve in hospitals, organizations and counseling centers as well as the advertising and marketing research agencies. In recognition of its achievements in teaching and research, the University Grants Commission (UGC) identified this Department as Department of Special Assistance (DSA) in 1989. The two thrust areas identified are Cognitive Psychology and Applied Social Psychology. Two phases of the DSA Programme (10 Years) have been completed. Recently in 2015 UGC has recommended the Department for SAP (Special Assistance Programme). Department of Psychology was awarded “Second” position in the event “Awards for good practice” during the Antardhwani-2013 organized by the University of Delhi, Delhi. The Department has a total strength of 13 teaching faculty out of which currently there are 5 Professors, 3 Associate Professors and 5 Assistant Professors. This includes 1 Professor, 2 Associate Professors in the Applied Psychology Unit at the South Delhi Campus. The teaching and research programme is supported by the technical staff at different levels. Apart from the Student Laboratory, meant for the practicum work for the students at the Master’s level, we have a few research labs, equipped with necessary amenities. The Seminar Room is equipped with the State-of-the-Art facilities. Presently the best and latest technology gadgets have been procured and set up to enhance the teaching and research activities. One of the strength of the teaching programme is to establish interface with Industries and Organizations working in varied domains as hospitals, NGOs, Corporate Sectors etc. The M.A. Psychology and Applied Psychology Courses include the latest trends in Psychology, with emphasis on practical training and field work. The courses lay special emphasis on the acquisition of knowledge and skills through theoretical understanding and its practical implications. The Department has already initiated the process of revising all the courses at the undergraduate and postgraduate level. In addition to lecturing as the primary mode of instruction, teaching is also interactive with due emphasis on seminar, presentations and discussions and also experiential exercises and peer mentoring. The Departmental teaching, research and field training are centered around contemporary issues as stress and health, ageing, drug abuse, community mental health, disability, neuropsychological assessment and rehabilitation, etc. A large number of our Master’s and Ph.D students after completing their degrees are employed by different organizations/hospitals dealing with these issues. From time to time, the Department organizes Conferences, Seminars, Refresher Course, Workshops, etc. for the benefit of faculty and students. It has hosted the Indian Science Congress Sessions thrice as well as an International Conference and various National Level Conferences. The Department has organized conferences on Cognitive Psychology, Quality of Life, Human Resource Development. Culture and Psychology, Health Psychology, Affect, Identity and Discourse, Puzzles of Perception and on Indian Psychology. In addition, many research projects have also been undertaken. The department has signed a MOU with San Diego State University which involves collaboration in teaching and research. The faculty of the Department have undertaken projects in the areas of mental retardation, dyslexia, examination anxiety, hypertension, epilepsy, drug abuse, cognition in disabled children, belief systems, ageing, organizational processes personality assessment etc. sponsored by NCERT, ICSSR, ICMR, UGC, DRDO and other funding agencies. They are actively involved in academic interactions at national and international seminars and conferences. Some notable accomplishments of the faculty include the following: Late Prof. H.C. Ganguli was nominated as FNA. He acted as President of Indian Psychological Association and received Sandoz award for work on mental health of workers, and was the recipient of the best book awarded by IMA. Prof A.K. Sen and Late Prof. (Mrs.) A. Sen were elected as President of the Psychology and Educational Sciences sections of ISCA. Prof. A.K.Sen, Prof K.D. Broota. Prof. Girishwar Misra, Prof. Ashum Gupta and Prof. M. Ittyerah and Prof. Nandita Babu have been awarded Fulbright Fellowship on different occasions for research and teaching at various U.S. Universities including University of Alabani, University of California at Berkely, Wisconsin University, Michigan University at Ann Arbor, and Yale University and San Diego State University. Late Prof. G.C. Gupta was a fellow of NIAS, The Hague, The Netherlands, IIAS, Shimla and CIIL at Mysore. Prof. A.K. Sen was a visiting scholar at the University of California Berkeley, National Lecturer of UGC, and a visiting faculty at the University of Bergen, Norway. Prof. K.D. Broota was recipient of Ford Foundation Fellowship for Post Doctoral work at the University of Wisconsin, Madison. Prof. (Mrs.) V.Veraraghavan was the President of Behavioural Medicine. Prof. M. Ittyerah has been an invited member of the New York Academy of Sciences and has been awarded the Commonwealth Academic Staff Fellowship by the University of Oxford. She was also awarded an Indo-French Research Project by INSERM, France. Prof. Aruna Broota has been awarded best educationist of the year award by Raja Ram Mohan Rai Foundation. She has also been awarded an International Award “Global Indian” San Fransico, USA and received lifetime achievement award from the Inderaprastha Educational Society. She has also been given a Distinction Award for combining Yoga Abhyas with Cognitive Behaviour Therapy by the Vishva Bharti Yoga Sansthan. Prof. Paramjeet K. Dhillon received a W.H.O. fellowship for research in Applied Social Psychology at the University of Exeter, U.K. She was also awarded Higher Education and Development Award by International Association of Educators for World Peace. Prof. Ashum Gupta received Commonwealth Academic Staff Fellowship, UGC Research Associateship at NIMHANS, Banglore. 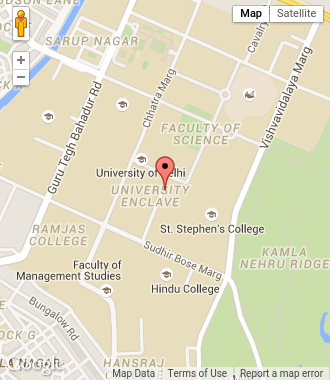 Indian National Science Academy award as Research Scientist, LC.M.R. fellowship as Trainer in Community Mental Health, NIMHANS, Banglore and British Psychological Society Award. Dr. Honey Oberoi Vahali was awarded the M.V. Govindaswamy award for Clinical Psychology and the Junior Nehru Memorial fellowship. Prof. G. Misra has received Radhakrishanan Award, Dr. Hari Singh Gaur Award, G.B. Pant Award, and Human Rights Commission Award for distinguished contributions to social science research. Prof. Anand Prakash received young scientist Award of Indian Science Congress, UGC’s Career Award. Prof. Bhardwaj has been honored by National Institute of Productivity Management for life-time contribution to Organizational Behaviour. Prof. N.K.Chadha was a Visiting Professor at University of Virginia, USA and Faculty of Health Studies, Auckland, University of Technology, New Zealand. Prof. N.K.Chadha was awarded DAAD fellowship at Dortumund University, Germany, INSADFG award at University of Heideberg, Germany and UGC-MSH award by French Government on Social Gerontology. Prof. N.K.Chadha has been invited by UNESCO to deliver status paper on the Intergenerational Issues for the developing world at University of Keele, U.S.A. He has been invited to be the member of Board of Governors, University Pittsberg, USA for intergenerational issues. Further Prof. Chadha was selected for the third time for the “Indo-French exchange program for Social Scientists” to visit France for one month jointly by the UGC, India and MSH, France. Prof. Nandita Babu was Visiting Professor at Department of Child Development, San Diego State University. Self Presentation in Children in UK and Indian, ISRC, Bretain. Psycho-social Problems of Older People in India Major project sanctioned by Indian Council of Social Science Research, Ministry of Human Resource Development, Government of India. Physical and Psychological Development among Two Communities: Major project funded by Indian Council of Social Science Research, Ministry of Human resource development, Government of India. Status of Girl Child in India: Major project funded by John Bjorkhem Foundation, Sweden . Marital Discord: Psychosocial factors. Funded by University Grants Commission, New Delhi. Development of Psychological Test for Selection of Scientist. Major Project funded by the Defence Institute of Psychological Research, (DIPR) DRDO. Ministry of Defence, Government of India. Predictors of Physical Functions of the Old. Major Project funded by the Indian Council of Medical Research (ICMR), New Delhi, Ministry of Health and Family Welfare, Government of India. Determinants of Functional Status of the Older Indian. Task Force funded by the Indian Council of Medical Research (ICMR), New Delhi. Ministry of Health and Family Welfare, Government of India. NCERT Research Grant for project entitled Facilitating Mental Health Through Value Inculcation, 2004-2005. 9. ICSSR Research Grant for project entitled Flourishing positivity in young women, 2007-2008. Co-investigator: Extending Services to People with Mental Handicap in Urban Slums, NIMH, RTC, Calcutta, (UNICEF), National Institute for the Mentally Handicapped, Secunderabad.